Most of us recognize this bundle of sticks as the very popular game of “Pick-Up Sticks” and most likely played it during our childhood. Just how old is this game? Stick games are ancient and prevalent in all cultures: India: c. 563-483 BC, Scythians: 450 BC, China: 12th century, Japan: 16th century. Regardless of the name, the concept of the game is quite simple: The bundle of sticks is held in one hand with the bottoms touching a flat surface. The sticks are then released to fall in a pile. The first player picks up as many sticks as possible, one at a time, without disturbing another stick in the pile. The black stick is often used as a “helper” to carefully maneuver sticks without incident. Typically the winner is decided by the point value of different colors. Often bonus points apply for more challenging maneuvers. The rules need to be determined prior to play. Jackstraws, although closely related to pick up sticks. Instead of sticks, however, jackstraws was often played with small wooden pieces carved into various shapes. The carved pieces made jackstraws much more challenging than pick up sticks, as it is difficult to remove pieces without catching them on others. Stores which specialize in games sometimes sell jackstraw sets along with other old-fashioned games, and it is also possible to make your own set. 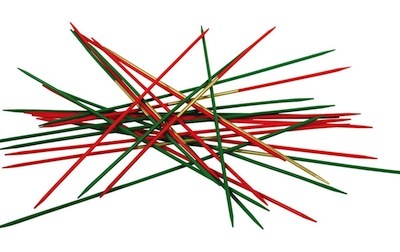 Pick up sticks is an ancient game; various versions of it are depicted in ancient works of art and writing, suggesting that multiple cultures developed essentially the same game independently. Players of exceptional ability are those demonstrating considerably steady hands and good coordination. If a player disturbs a stick as she or he moves, the turn is over, and play passes to the next player. Some players use this rule as a point of strategy, distracting players as they move in the hopes of forcing them to disturb the pile of sticks, creating a new arrangement which may make it easier to extract pieces. Pick up sticks in turn was the foundation of a lot of other games, especially in China, where a game similar to pick up sticks was used for gambling, and another variant was used for divination. The precise origins of jackstraws are a bit unclear, but a version of the game appears to have become immensely popular in England, at which point it crossed the pond to the the colonies and became known as jackstraws. The pieces in a jackstraw set are often thematically related, as for example in a set which includes farm implements like ladders, rakes, shovels, and hoes. Sometimes the pieces are carved more abstractly, with the goal being the creation of multiple jagged or confusing edges which make the game more challenging. When the jackstraws are dropped, the protruding edges of the pieces tend to lock together, making it very hard to lift out a single piece without disruption. In addition to the jackstraws themselves, the game typically includes a helper piece with a hooked edge to help people grasp and manipulate pieces. Each piece in the game also has a point value, with more challenging pieces being worth more points at the end of the game. At the end of play, points are tallied up and the pieces can be thrown again or stored in a container for another use. Carson, Jane, Colonial Virginians at Play: Williamsburg, 1989. Child, Lydia Maria, The Girl’s Own Book: Carter, Hendee and Babcock, Boston, 1834. Deady Kathleen W., Early Civilizations: Capstone Press 2004. Dulles, Foster Rhea, A History of Recreation: America Learns to Play: New York, 1965. Gabriel, Matilda, Games we used to play: The Straits Times, p. 22. 1983, March 27. Lim, Rosalind, Gateway to Asian games: Asiapac Book, Singapore 2006. Rountree, Helen C., The Powhatan Indians of Virginia: Their Traditional Culture. Norman: University of Oklahoma Press, 1989.